The Brothers Coen, writer/ directors Joel and Ethan, are smart guys in love with Hollywood movies, the people who make them, actors, directors and studio executives and assortment of tradesmen, call girls, corrupt cops, sycophants, idiots , fools and intellectual flyweights who inhabit this world of eccentric denizens. These are creatures managing to create the magic and myth making that has kept American enthralled sitting in dark theaters for decades, excited and inspired by images and tales that taught generations how to know right from wrong, how to love, how to be brave, when to love, when to cry, how to pick yourself up and face the new day with a smile and humming spry song as they walk with great purpose into an endless series of serene sunsets and hopeful sunrises. We know this as "The Hollywood Ending". Hollywood producers required endings encouraging audiences to wallow in the fantasy of easy Happiness at the end of every critical moment , to return again, buy more tickets, eat more popcorn , and invest further on a collective consciousness embedded by lights and shadows flashing across a silver -grey screen. 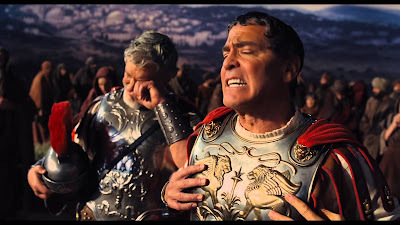 Joe and Ethan Coen are all about Hollywood endings, but what in a turn in a career noted for quirk, screwball antics, unexpected departures from developed themes and genre expectations, they've made a splendid new film about Hollywood endings, Hail Caesar! Eddie Mannix, a studio executive for Capitol Pictures who heads a department that names him the head of "Physical Production", a position that essentially makes a him the studio's "fixer" who keeps the potentially embarrassing details of the lives of their stars out of the newspapers. The movies are successful because of the fantasies they contain, and the actors are part of that concoction as well. Only the names the studio has given them and the back stories publicists concocted for them are allowed for public consumption, and it's Mannix's task to keep quirks, unacceptable politics and sexual preferences, alcoholism , drug addiction, religious deviation, safely sequestered far from the public view. You get the idea; in this period, set in the late forties-early fifties in the waning years of the Golden Age of Hollywood, the Movies Are American , and the Actors Are Americans. One loose thread can make this whole garment fall apart.Eddie Mannix's job is to keep things stashed where they need to be, to make problems go away, to keep the production line humming right along. Sometimes it seems too much even for his broad shoulders, starting when the star of this religious epic in production "Hail Caesar! The Story of the Christ" is kidnapped . Mannix gets on the case of finding the missing star Baird Whitlock (George Clooney), whom he suspects of going off on a bender. Whitlock, still in his Roman soldier costume, awakes from a drugged stupor , finding himself secreted in a regal beach house in Malibu perched on a rocky crag on the shore line, where he shortly meets a room full of chain smoking Marxists, actually screen writers disillusioned with Hollywood when they didn't get rich from the successful movies they wrote, seduce the shallow Whitlock with the rudiments of Dialectical Materialism and how he, a victim of The System no less than the common man on the street , can participate in his own taking and help turn the Studio's energies against itself and cause the whole enterprise to collapse. Whitlock is the not the most critical of thinkers and soaks up the Marxist cant easily. Would you like to help free the common man on the street he's asked. Baird pronounces that he's all for the little guy and that he'll ago along. Moments after he becomes a freshly anointed Communists committed to world revolution, Whitlock goes for what he knows, asserting that he ought to get a cut of the ransom from his own kidnapping. What follows is a kind of shaggy dog story that only the Coen Brothers seem capable doing consistently well, the tale where one nettlesome situation is compounded by other pitfalls, booby traps, and situational snafus having no apparent end. Mannix, a squared jawed, forthright, dedicated man who wants harmony and and benign order in the manufacture of images, has more than the Whitlock imbroglio to deal. The things that go wrong resemble nothing so much as a chain collision, a bunch of small things that add to an oppressive weight: a star of Esther Williams aquatic ballet fantasies stops a scene being shot and off camera has trouble pulling off her mermaid costume because she is pregnant and unmarried. Mannix 's job is to get her married and legitimize the unborn child and have a story the public will accept. Elsewhere, a high society movie under production has no leading man with either acting chops or elegance to fill the a crucial role. Mannix is ordered to bring in an amiable and earnest cowboy star to fill the role. The problem, of course, is that the young man can't act and his drawl, sweet as it sounds, is intractable. The director , a man of high manners and worldly in ways more than could be openly discussed or depicted in the Golden Age films, tries to get the suddenly dark suited hick to enter a party, walk over to a couch when beckoned by a young ingenue and to reply to her with a simple response. This winds up with the director trying to give the uncomfortable cowboy acting lessons, face to face, trying to get the poor man to change the way to become more stylized in facial expression and vocal cadence. Each time the cowboy actor fails , the frustration increasing , the clash of culture and lifestyle providing perfecting comedy tension. The director comes to Mannix to complain, but Eddie lays down the law saying that the decision comes from the studio owners and says the director has to make good with a bad fit for the role. The director acquiesces and leaves, but Mallick wonders whether this will work at all. The pile up continues through the film, one thing after the other, each threatening to bring down the tent. The Coen Brothers have a sure touch in the way in the way sub plots are introduced, resolved or handled, and the way they use devices to get to ideas that other wise wouldn't fit the main story line quite so neatly. This being a film about a movie about movies being made and the illusions being created, it was an inspiration for them to have a number of scenes that were a review of bits of film being edited, a cogent way to lampoon classic Hollywood genres quickly and surely. In the "Hail Caesar" sequence, there is a glorious shot of clouds back-lit with Maxfield Parrish-style sunlight, everything celestial and heavenly, but suddenly there is a card that appears reading 'CREATOR TO BE SHOT" to single that the image that follows is still pending. It's a wonderful blending of two themes the movie introduces, the first in Mannix, a religious who goes to confession , it seems, at least once a day, who prays the rosary over the problems he has to fix, with that of the apparently atheist Communist cell of screenwriters who fancy they have discovered the Science of History and who dedicate themselves to solving the ills of the world through more drastic means. 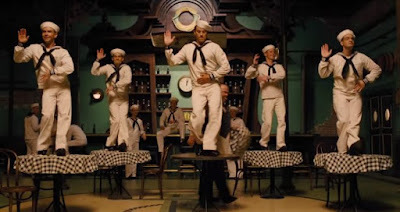 Intriguing as well is a preview of a musical under production, a bar full of sailors who , watching the girls leave at closing time and who are going to sea for eight months, begin to moan and groan that they "won't see no dames" where they will be. This turns into a song and then an athletic dance sequence, male sailors, in full whites, dancing with other male sailors, vaguely hinting as while singing about about everything they can do with each other , but that it will be different because there won't be no dames. It is a fun,well rendered dance number, with barely contained homophobia at the root of it. It's a nice reference and tribute, I suspect, to the legacy of closeted gay writers,directors actors and actresses that worked in Hollywood for decades, adding the brilliantly coded stylistics from the diverse elements of gay culture, a monumental contribution to the art of the Hollywood movie. Hail Caesar! is a shaggy dog story , of course, quirky , elegant, slap stick, stammering, screwball and acidly satiric at various turns of plots and subplots. Joel and Ethan Coen thrive on going against expectation , with an uncanny sense of timing of when to do so. They are adept of getting you hooked on a notions being played out on the screen and then interrupting it with zany intrusions that are their subversive way of telling us that the movie makers are only telling stories that are supported by an audiences willingness to stop arguing long enough with the ill-logic of movie's premise and enjoy the brief respite a good yarn avails us to. The point of a shaggy dog stories is that there are not points, that once a story begins and proceeds through related incident and complication as new locals and characters of all sorts are introduced over the course of the fictional journey, one expects a great punch line, a profound moral, illustration of life - affirming platitudes, or some horrible, inevitable tragedy; shaggy dog stories aren't like that though. The end of them are usually some small pun for which the build up was more intricate than it needed to be, but that's the point. Everything winds up where it's supposed to be by forces subtler and more incidental than we can imagine. What the subtle forces maybe are unknown at any given point , and the Coen Brothers don't speak to that. They make movies, though, that have us laughing and scratching our heads at the same time, evidence of genius in my view. Hail Caesar! is a funny, busy, puzzling and literate screwball comedy, compelling in it's engrossing mixture of sweetness and cynicism. Very fine stuff indeed!